New Maruti Suzuki Swift Will launch at Auto Expo 2018 Bookings Open. The india’s largest carmaker Maruti Suzuki will launch the new Suzuki Swift on 7th February at the upcoming Auto Expo2018. 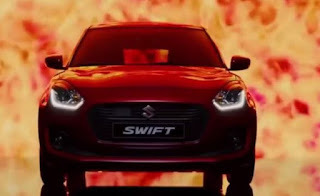 Maruti Suzuki also started it’s pre-launch booking from 18 January for the new Swift for a token of Rs 11,000 in india. The new swift will be available in both petrol and diesel engine options. While the petrol variant will have a 1.2 litre vvt engine and diesel engine is powered by a 1.3 litre ddis engine as per the company information.This both two engines are really better for good accelaration and fuel efficiency.The diesel engine will give you 28.4kpl, while the petrol engine give you 22kpl. The new Swift also has 10% better acceleration performance than the old swift.A major change in new swift model is in the gear shift pattern,Now both diesel and petrol swift get the Auto Gear Shift (AGS) technology or AMT as an option. The new version of suzuki swift is wider and has longer wheelbase with more cabin space, headroom and luggage space than the present generation’s car. also The company claims that in new Swift the wheelbase is 40 mm wider with 20 mm longer.The luggage space has also increased upto 58 litres. Dual airbags and ABS with EBD and ISOFIX (child seat restraint system) are there in new genaration maruti suzuki swift.